"While we were in Ubud in Bali, we went on a cycling tour of the countryside and it was one of my favourite things about our entire time in Bali. On our penultimate morning in Bali we rose early to be picked up for a cycling daytrip with Bali Eco Cycling. This was another recommendation from a friend and it�s a daytrip beginning with breakfast at a viewpoint overlooking the enormous crater of the Mount Batur volcano, which last erupted in 2000." If you�re reading this right now, it means that you�re looking for a fun and exciting way to see the Bali off the beaten tourist path. You know that there is more to experiencing Bali than just the crowds and tour busses, hanging at the bars in Kuta, or the head spinning shopping frenzy� and yet you haven�t figured out exactly where to go to get the insider�s peek at rural village life and the beautiful backdrop of Bali�s countryside. Biking and Trekking in Bali is one of the BEST and most UNFORGETTABLE ways to explore the people, the land and the Balinese way of life. You're ready to discover the authentic Bali culture and landscapes by bike, which look like pictures in magazines. You have to limit your independent Bali bicycle jaunts to countryside's in and around Ubud and Lovina. And check the weather before you go - if sunny weather just isn't forthcoming, you may need to postpone your bike ride for safety's sake. If sunny weather just is not made for that day, it may be necessary to delay your bike ride for sure. You can rent a bicycle at a rental for around IDR 25,000 per day. Pickings may be slim if you're looking for a specific type of bike. 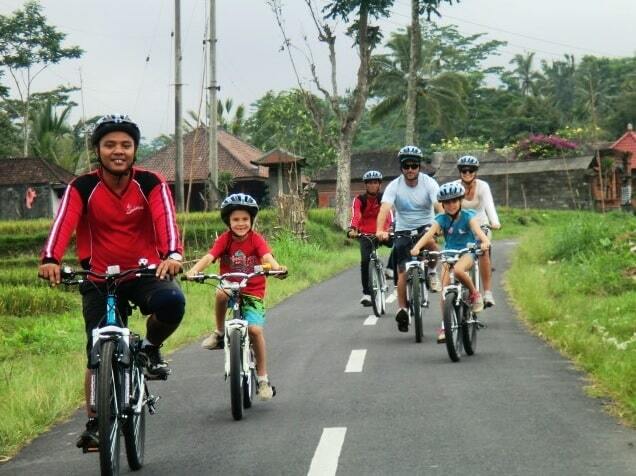 If you're an avid bicyclist, do bring your own bike to ensure the best Bali bike experience possible. Bring your own helmet and gloves (or rent them) to ensure adequate protection; renting the right gear in Bali can be hit-or-miss. There are bike tours for all types of bikers of all ages, from the mildest of beginners to the most hard-core mountain bike enthusiast. The cost of the tour often includes meals, safety gear, and return trips from and to your hotel.